Bet Poker game was reviewed by HighPulseRakeback.com and earned a 10/10 rating. Bet Poker is a new game available only at High Pulse Poker. This game combines Texas Holdem and Betting in one interesting and unusual game. You will find Bet Poker only at High Pulse! This game is unique. This game allows to bet on poker probabilities. Actually Pet Poker is betting on players at the poker table. These players are not real and their names are A, B, C etc. These players are at the poker table and you can see their cards. You can bet on any player depending on your idea about the winner. You can bet on each player “Win” or “Lose”. If you think that Player A will win you should make a “Win” bet. It is easy and you will understand Bet Poker after the first hand is finished. NOTE: You do not play against other people in Bet Poker. Betting system is similar to Roulette. Every player can bet on any hand. You do not have to pay blinds or other fees. You can wait for proper hand as long as you wish. 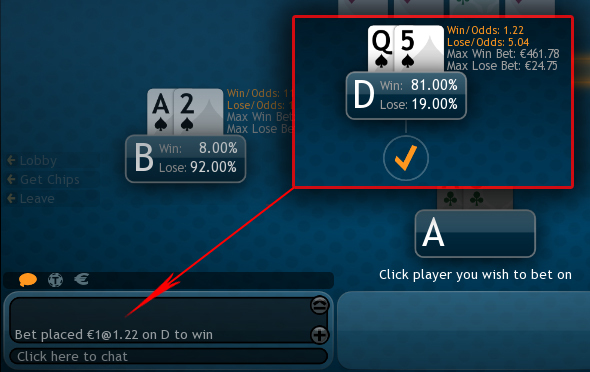 There are 3 types of BetPoker tables available: 9-max, 6-max, 4-max. It does not mean that only 4 people can bet at 4-max table. No, that means that there are 4 players at the table “playing” poker (A, B, C and D) and you can bet on these players. Players A, B, C and others “play” Texas Holdem Poker. Hand rankings and most rules are taken from Texas Holdem. But they do not raise or bluff. They are not bots and they do not act. They just get cards. Every hand in Bet Poker is played from the Preflop till the River and Showdown. The hand could not be finished ahead of time. That means that the situation at the table can be changed after the next card appears on the board. Minimum amount: 10 euro. You need at least 10 euro to join BetPoker table. But it does not mean that you will have to bet the whole sum. No. Minimum betting amount is 1 euro and you can decide how much you want to bet. You can change betting amount using special wheel. The betting system is similar to betting at poker tables and if you know how to play poker you will not have difficulties. How to bet and how to calculate profits? When you bet on any hand you will see special Win/Odds and Lose/Odds. These odds are special multipliers. They show your possible income if you bet on the current player in current situation. If you win your bet amount will be multiplied by the Odds you were betting on. If the Win/Odds: 1.22 you will be able to receive 0.22 cent profit per every Euro you have bet. This line shows all information about your bet. This information will be used for your profits calculation. That means if you bet on Player D during the flop and betting odds are 1.22 your income will be calculated after the showdown according to this information. It does not matter what will happen with odds on the turn and river. If you win you will receive your income according to the odds you were betting on. When you play at bet poker tables you pay rake from your winning bets. That means you will receive rakeback and Step Points. Moreover, your affiliates who play bet poker will bring you income because they will also pay rake and receive rakeback. That is betpoker will also help you in achieving highest rewards at High Pulse Poker. This system is great and you will benefit a lot! How to win playing Bet Poker? Bet Poker strategy is not simple. You will have to be patient and wait for the good situations for betting. You should find your own balance between risk and profits. The higher the risks are the more money you can win. For example player D at the picture above has Lose/Odds: 5.04 and he has 19% to lose. The odds are great! 5 to 1. You can bet 10 euro and receive 50 if player D loses the hand. But the situation at the table shows that he has only 19% to lose. At the same time his Win/Odds: 1.22 and he has 81% to win. The profits are not so attractive. Only 2.2 euro for “Win” bet vs 40 euro for “Lose” bet. What is better? Every player must choose for himself. Bet poker strategy combines many factors. You will be able to choose a strategy that suits you.